In Tokyo’s Akihabara, Card Shop Spiral sells inexpensive and super expensive Yu-Gi-Oh! cards. The priciest one in the shop is Blue-Eyes Ultimate Dragon. The tag says it’s the only one of its kind in the world. 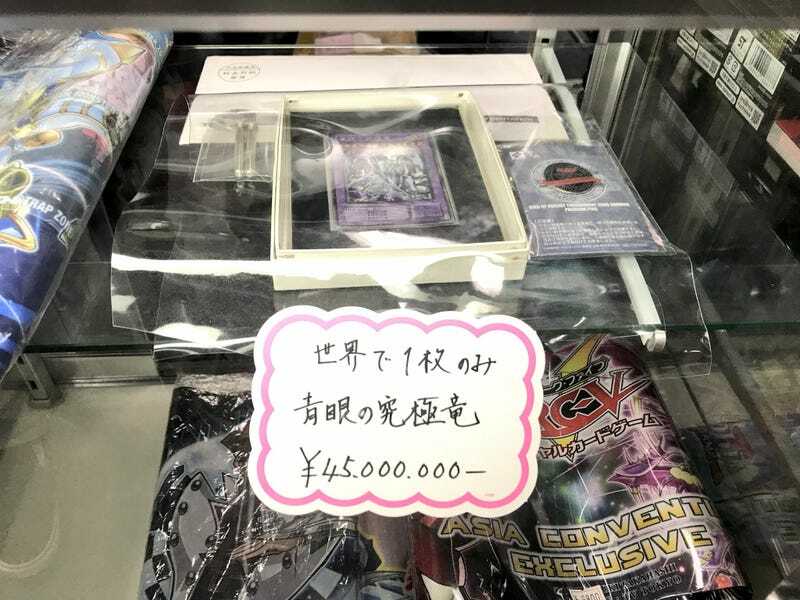 As noted on Otakomu (via ANN and SoraNews), the card was a prize at the Asian Tournament Championship, explaining why its packaged in a special custom-made case. The card comes with Yu-Gi-Oh! creator Kazuki Takahashi’s signature. The card’s owner, Saku06s, is displaying the rarity at Card Shop Spiral, where it hopes to attract someone willing to part with $402,000. If you think that’s expensive, ANN reports that the original asking price was $904 million. So at $400,000, this is a steal!